This was a busy walking week. Although I returned to Cómpeta on Thursday night (14 March), I decided to delay resumption of training until the start of the new week. However I had not reckoned with the result of a severe over-indulgence on Saturday night when we went to the Museo del Vino to see the band ‘Elderly Brothers’ play whilst we ate dinner with our good friends Lyn and Jens-Kristian. There were lots of good friends in attendance and I somehow managed to consume more red wine than was my fair share. Although I had a thoroughly excellent time, I paid a severe price the next day, and even the day after that. It is obviously an age related problem, a few years ago I would have functioned perfectly well after such an occasion. So my new boots had to wait an extra day for their first outing. On Tuesday (19th) I walked 9.25km and was aware of a ‘hot spot’ (pre-blister rub) on my right heel, but no other footwear issues. On Wednesday rain was forecast, but I decided to walk nevertheless, as I won’t have the luxury to choose to walk only in fair weather when I am on the camino, and it would give me an opportunity try out my rain jacket. I set off in my new gear: fine merino wool long sleeve t-shirt, zip off trousers, ultra light weight down body warmer and my rain jacket hanging from my belt. I took some tape to apply to my heel if it gave me any problems and set off with Roly on the 19km training walk. When I take this walk I pass several places where dogs are chained and bark furiously as we go by. Roly doesn’t really help matters as he charges up an down, just out of reach, and aggravates the poor dogs to distraction. Towards the quarry is a property where an Alsatian type dog is tied on a very short chain, it seems not much more than a metre. This dog is kept company by a charming pup, probably about six months old, quite large with a beautiful, mournful face. He was originally a little shy, but we pass so frequently that he is now very friendly, seeming to crave company and almost hugging me when I stop to talk to him. He always goes to follow me, but when I indicate by showing him the palm of my hand that he is to stay, he then stands in the road and stares after us until we disappear from sight. 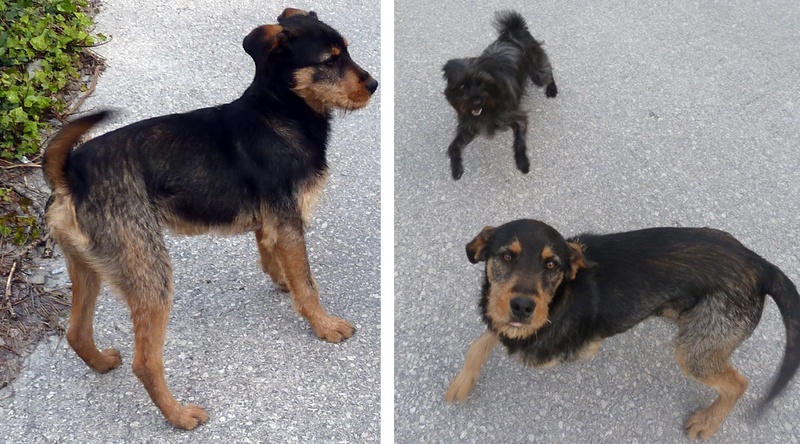 I have never seen anyone at the property and although these dogs seem well fed, they are starved of compassion. Unfortunately this is not particularly unusual in this area of Spain. After 7km I stopped to put tape on my heel as it was rubbing to a blister and continued on my way. A few km’s further on I stopped to take a look and found the plaster under my foot, where I suspect it migrated to within a few steps of being applied. By this time I realised that my my heel hurt mostly when I was walking uphill and was ok on the flat and downhill, and by now I had completed the main climbs of the walk so I was not too worried. When I got down to the fabrica area I could see that the stream flowing across the path that I usually pick my way across was much faster and deeper than normal. As I stood at the edge pondering the best way to cross, the dog suddenly decided that he would show me the way and charged across in two great leaps, turned around looking very pleased with himself and repeated the exercise in reverse. I realised that I would have to take his advice, hoiked up my trousers legs and tried to emulate his prowess, not quite matching up to his gazelle-like athleticism, but I got to the other side in a couple of strides without getting too wet, at the same time testing my new boots for water resistance. A few hundred yards on and I have to repeat the performance, with a similar result. However when I get to the actual river crossing, it is a totally different matter. I have never seen the water so deep or so fast flowing and as usual I make my way up the bank to find a place to cross, but have to go quite a way before I find a place that I think I can leap across, it takes me a while to get the nerve to jump, during which time Roly is having a mad five minutes on the other side, charging around like a lunatic. I finally pluck up courage and just about make it across slipping a little on landing but not falling back into the deep water. The dog is still going crazy and it takes him a while to calm down. He is very funny. I had plenty of opportunity to try out my jacket as it started to rain, not too hard but very steadily, halfway through the walk. I found out immediately that I could not zip up the coat because I was carrying a water bottle on my belt. If I had thought this through, I would have bought a jacket with a two way zip, but when the rain persisted I decided to carry the bottle by hand in favour of keeping dry. I cut the walk short by 1km to avoid a steep uphill stretch because of my blister, just leaving the dreaded driveway to climb at the end. Today’s walk proved a good test for my new clothes and I clocked up 18km. 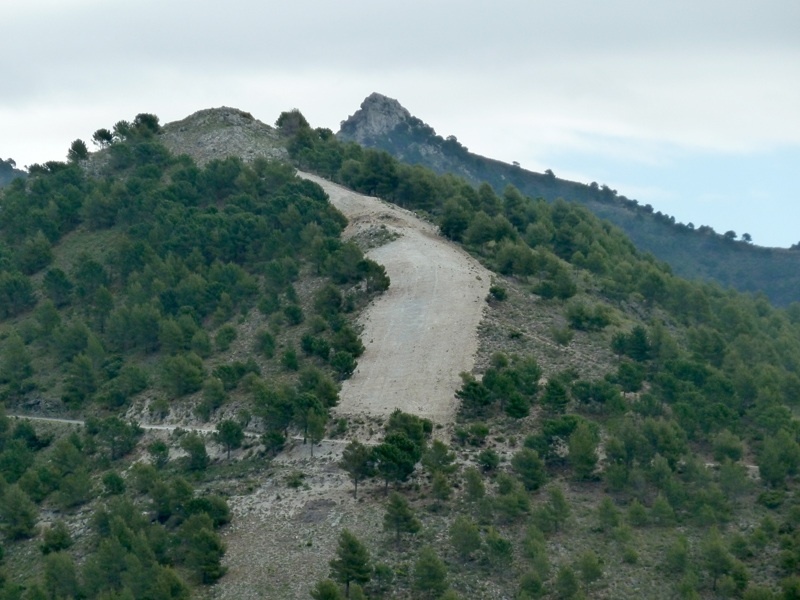 On Thursday I walked with John, a friend from the village, who offered to show me a new route. Lyn came along and we walked to the fabrica to meet up with John. We took a very steep incline up to the white track above, a short walk along the level track and then another climb, up the fire-break for a few metres, and behind a sharp peak before starting our descent, which eventually led to a point halfway along the track that I know as the ‘forest ride’. We trekked downhill until we met the track above the fabrica, at which point we parted company with John who retraced his steps back to his car, and Lyn and I went in the opposite direction to return home. This walk was virtually 20km, and quite hard going, but I was pleased that I felt fine at the end and that my blister was not causing too much discomfort. 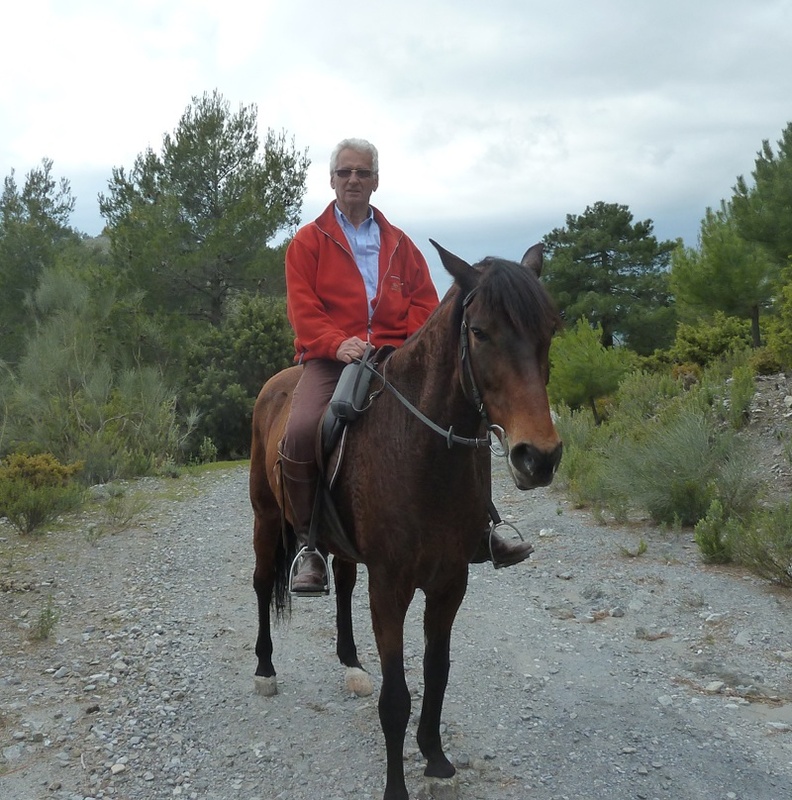 On Friday I suggested to David that he might like to ride alongside me, and so I set out for the fourth day running, down into the Canillas valley and up the incredibly steep track the other side, and then onto the shorter version of my practise walk. 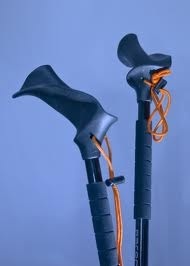 On this occasion, having made a start on wearing-in my boots, I decide to try out my trekking poles. Now, I have often made disparaging remarks about people using poles to walk along easy tracks, but during my research I have discovered that their use can alleviate a significant amount of weight from the leg joints, and taking into account my age and lack of experience, I thought I should swallow my pride and give them a go. I purchased a pair of ‘pacer poles’ with unusual angled contoured handles which are very well reviewed by all who use them. 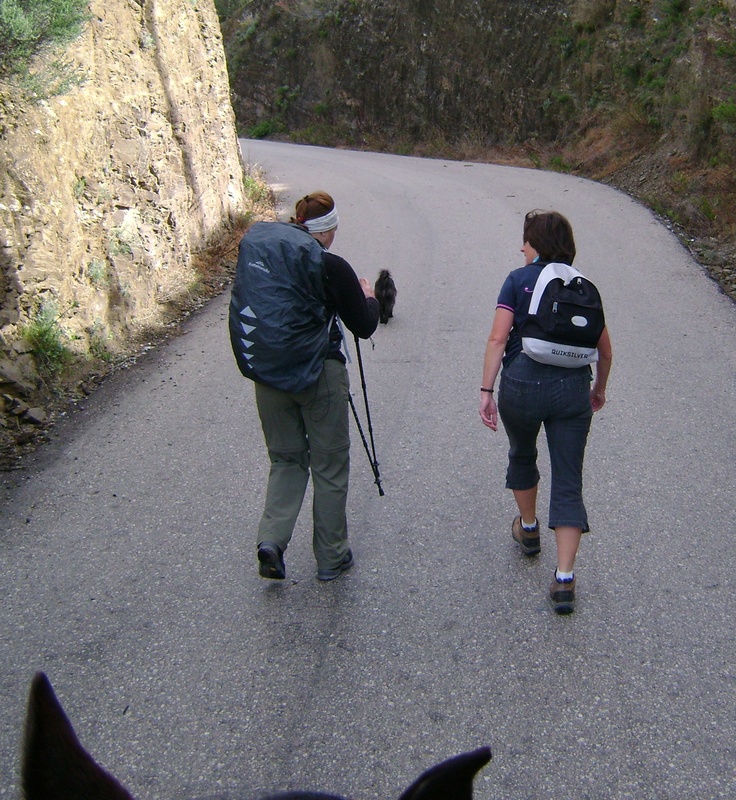 Having kept them telescoped and under my arm until we reached the track, I adjusted the length for the terrain and tried not to trip myself up until I got used to them. I found them a bit fiddly to adjust the length for level ground, uphill (shorter) and downhill (longer), but it didn’t take me long to find my stride with them and they did seem to take some of the strain when walking up the steep side of the valley, although when the track is very narrow, with shrubs alongside, they are difficult to use. David and Liana reached the top long before I did, and when I caught up we tackled the next stage, also quite a climb, and finally it levels out before we begin the descent to the fabrica. I repeated the procedure from a couple of days earlier, leaping across the streams and finding a crossing place at the river, by which time it had started to rain quite hard, and David decided to push on and get Liana back home asap. Poor Roly was torn between rushing off after David or staying with me. My little friend finally decided to stay with me and we walked as fast as we could, having covered 11.5km. After a day off on Saturday, I set out again on Sunday with Lyn, and David on Liana. This time I added another piece of vital equipment, my backpack stuffed with various items, including two bags of flour and one of sugar and weighing in at 7 kilos. This is the first time I have ever carried a pack and I have not been looking forward to the experience. However during the shortish walk of 8.5km I did not find it too much of a burden and for the most part was not really aware of it. It was obviously worth all the care I took in choosing the pack and I am very much relieved. David took these photos. I love the one of Lyn and me taken through liana’s ears. In case you are concerned, I would like to mention that I have not had a blow to the head, I am wearing a headband that I have discovered is a fantastic thermostat – I can heat up or cool down instantly by covering or exposing my ears to the elements, and can keep my hair off my face at the same time. As you can see, glamour is not part of my training regime! This week I have introduced the main items of equipment I need to get accustomed to. I now need to walk greater distances with the pack and build up the weight to 8.5 kilos. During the week, including dog walks, I have hiked over 70km. Roly has probably covered twice as much ground, and is getting very fit, with very strong muscles. He is great company and I really appreciate having him with me. 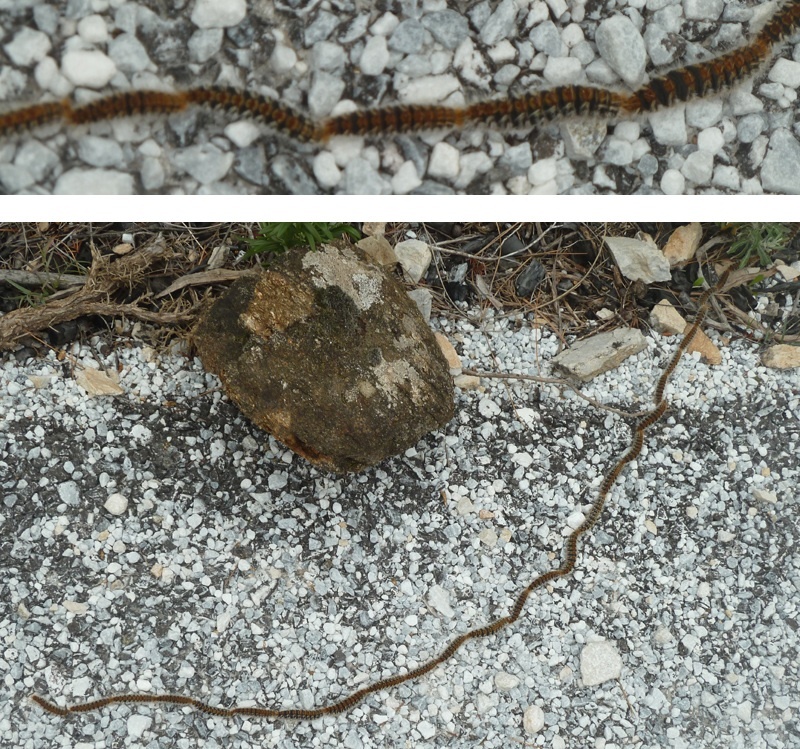 During my walks this week I have had my first sighting of processionary caterpillars, which breed in the pine trees in this area. Our land adjoins the natural park and has many pine trees in which these horrible creatures nest and at this time of year they hatch out and form an orderly queue, then in a ‘nose to tail’ formation descend from the tree and go in search of a suitable place to burrow underground to change into the adult moth. When they are moving on the ground they can be mistaken for a piece of string and can stretch for metres. I came across the longest procession I have seen this week, spanning three metres across the track and extending another two metres down the bank. They are very dangerous to animals and humans as they have barbed hairs that they can expel, which cause severe irritation and even anaphylactic shock. If dogs get them in their mouths it may result in partial amputation of the tongue. They are to be avoided at all costs. This is also the time of year when the wild flowers are beginning to put on a show, and they are absolutely delightful at the moment, particularly as we have had so much rain this year. 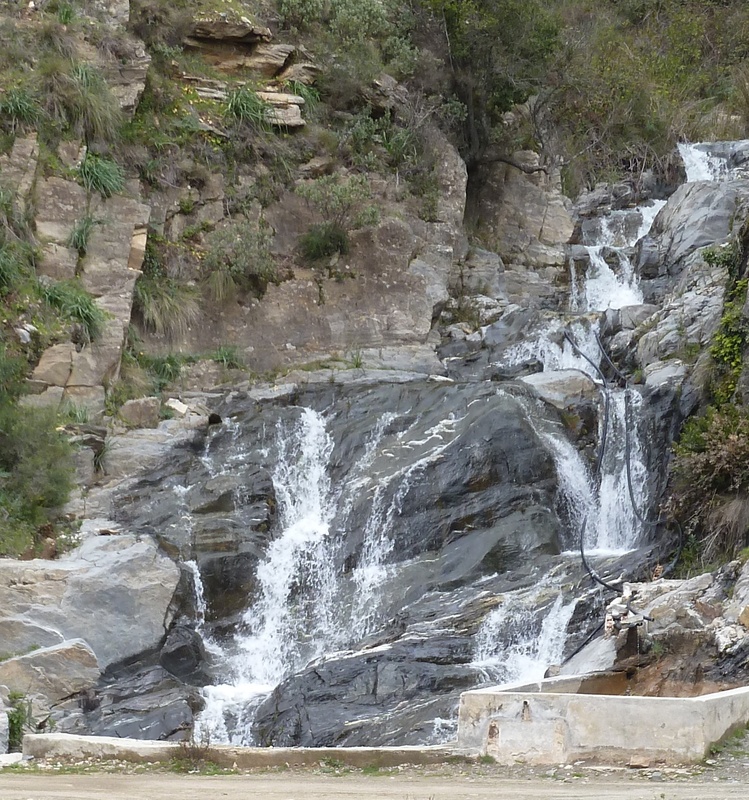 Also the waterfalls, gathering pace as they tumble down the mountainside, are spectacular this year.